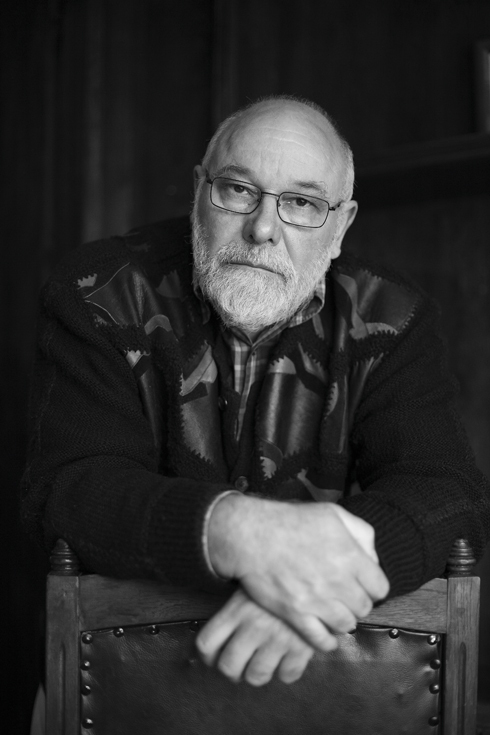 Vladimir Zarev (BG), born in 1947, is Bulgaria’s leading contemporary writer of fiction. His literary works span four decades and a variety of genres, but he is best known at home and abroad for his ten novels. The best-selling Ruin (2003), currently in its ninth Bulgarian edition, was published in 2007 in German as Verfall (Kiepenheuer & Witsch) to great critical acclaim, being hailed as "the novel about the changes in all of Eastern Europe" and garnering over 40 reviews in leading German-language media. Zarev is editor-in-chief of the literary journal Savremennik. Zarev lives in Sofia with his wife, the poet Mirela Ivanova, and their daughter. The heat was unbearable. The swelter sucked me in and numbed me, the headstone burned my hand. A pack of dogs crouched nearby. Dulled from hunger and sloth, they were waiting for the funeral to end so they could feast on what family and friends had brought to the graves. Strange looking thanks to accidental interbreeding, these mongrels replayed the whole inexplicability of nature. With elongated snouts and short legs, with guilty eyes and shapeless ears, ugly and sunk in the general misery, they fed on human grief. The sun lit up the crushing desolation of the Malashevtsi Cemetery, the crestfallen weeping willows, the dilapidated benches and lamps, the headstones with their photos pried out, the plastic cups and paper scattered by the wind, the endless rubbish of this final resting place, which, rather than solemnity and peace, emanated only exhaustion. The two priests chanted at cross-purposes, sweating beneath their faded cassocks. I got the feeling that mom, too, was sweating in her formal suit, which she hadn’t worn in ten years, since she had nowhere to go in it except to her final rest. The drapery in her plywood coffin was askew, her make-up had gotten smeared, and she had the unhappy look of a person begging to finally be left alone. I struggled to not think, to close myself up in my fear, but I couldn’t. I noticed the details, they called to me, seized my attention and forced me to be present. The heat was stifling, I felt my bodily fluids coming to a boil under my black suit, moderately thick so that I could wear it in the winter, but also in the summer. I was soaked, if someone had licked me, they would’ve realized that I was salty, too. I had overdone it with the deodorant, the smell of Gillette mixed with the sluggish sighs, the mawkish scent of the wilting flowers and human fear. I was afraid of mom, of that expression of severity, of irrevocable estrangement, which had taken her away from me forever. I wept for her with abundant perspiration that morning, a morning which was so motionless that every twitch demanded effort, while every effort induced dizziness. I was painfully attached to mom, but I didn’t feel grief, because I wasn’t sad for myself as well. Every death of a loved one is part of our constant dying. With the end of a beloved person, a part of us perishes as well, a part of our love, our openness and certainty. A void is left, which cannot be filled with anything. Like a board torn out of a fence meant to hide and protect us. While mom withered away in that dump of a hospital – they didn’t even have money for sheets and medicine – the details poured out around me. I was forced to think them out. Someone flushed the toilet in the shared bathroom, mom’s slippers jutted up absurdly on her feet, but she was already gone. I felt an inhuman loneliness. I looked towards the window, but there was no one there but the sky. The faded sky, threadbare to the point of tearing, crashed down on my shoulders. I kept thinking and that was what did me in. I didn’t dare even sigh, because I had drunk two "Men-Know-Why" beers at Ivana’s little bar and yet another at the bus stop in front of the cemetery. My wife leaned towards me and whispered in my sticky ear: "How could you? How could you…"
"How could I what?" I asked. "I’m sad about mom." I tried to worm my way out. "You already started in this morning… on today of all days." "I’m sad about mom," I repeated, but I wasn’t sad, because I didn’t ache for myself as well. I was afraid of her, of her half-closed eyes, with which she seemed to be watching me, of the waxy arrangement of her fragile body, of the distressing fact that she herself was not there, even when she was right there before my eyes. The stench and indigence of the Malashevtsi Cemetery overtook me, the patience of the street dogs scratching their fleas, all the oppressive details which forced me to transform this moment into a memory. Several of the old women from my mother’s building, her last living friends, were sobbing. They clutched kerchiefs in their gnarled fingers and wiped their eyes, they were crying for themselves. It is edifying to go to graveyards, because only in such a peaceful place can one understand the whole fragility of life, its absurdity, make sense of one’s vanities, the defeat of one’s foolish ambitions. What a fantastic muscle life is, yet what patience must death possess? "She’s smiling," my wife whispered. "Just one beer," I replied, "at Ivana’s." "I didn’t even drink the whole bottle…"
The bald priest’s censer was rattling like a chain, the elevating scent of incense thickened the air completely, making breathing intolerable. Mom wasn’t a believer; however, depressed by the poverty of the funeral, the cheapest one Eternal Sleep Mortuary could offer us, Veronica insisted on seeing her off like a Christian. The undertaker had paged through the catalogue in front of us, starting from the pompous coffins with brass plating, magnificent and gleaming like grand pianos, then had hardly managed to hide his disappointment, wiping his forehead with peeved politesse and addressing Veronica as "my dearest lady." "We insist that there be two priests," my wife said, "there won’t be many mourners, but I want there to be two priests." A barefoot Gypsy woman was squatting with her baby twenty yards away, smoking. She was watching us, but she didn’t see death. She would beg from the mourners, or she, too, like the homeless dogs, was waiting for us to leave, so she could gather up the stale food brought to the dead in the nearby graves. There were thistles stuck in one of the priest’s cassocks. He, too, did not see the mystery, the death, but instead the open bottles of wine. It is astonishing how much one notices when one doesn’t invent the details, but rather, as Buddhism presumes, is immersed in the emptiness. Most likely the emptiness is eternal life, since it is eternal death. I sensed slight pain and fear. All of I sudden I realized that I was afraid of myself and of my own life. I felt a wild desire to talk about politics and to drink another Men-Know-Why in the uterine coolness of the City Library. "Not just one, not just one," my wife said and began wiping away her suddenly erupting tears. The meadow that crept along the ring road and rose towards Vitosha Mountain seemed to begin from the sixteenth storey of our panel-block apartment building in Youth Neighborhood. Its boundlessness was broken up by piles of crumbled plaster and trash, it was strewn with torn plastic bags, which fluttered in the grasses and scrub. Faded and battered see-saws adorned the little park, but it radiated only shabbiness and apathy with its several stunted little pines, despondent, soaked in dog piss, and planted by the block’s inhabitant on long-ago Lenin Saturdays. If I squinted and stretched out my hand, it seemed that I could touch Vitosha, sometimes I felt like I could speak to the mountain, twenty-five years ago, when I was still a young and promising writer, I believed that I was in a position to measure myself against it. Black Peak would bathe in the sunset, bluish in the east and blazing fiery in the west. Everything around would bleed without reason. The grandeur was painful. My boxers stuck to my thighs, I had taken my third shower of the day, and had also drunk four more Men-Know-Whys downstairs, at the boys’ shop with the money Veronica had given me for hotdogs. I was sweating, as if continuing to weep for mom. On the top floor we pulled on sweaters in the winter, while in the summer we stripped down with the shamelessness of the poor. I found satisfaction in my own heft and flabbiness, actually in the disgust which my nakedness provoked in Veronica. My once "terrific" body had become misshapen, the beer belly prevented me from seeing beneath my navel my most manly of attributes, which had brought me so many surprises, joys, yet mainly troubles in my obliterated life. "Just take a look at yourself… you look like a pregnant woman," Veronica would say caustically. "Beneath a big stone hides a big fish," I would reply, to fan her despair, her helplessness, that last, as-of-yet unexhausted part of our love which is called hate. The more we sank into loathing, into our profaned love, the lovelier Veronica grew, as if her beauty and her contempt for me were interconnected vessels. Petite, plainly pretty thirty years earlier, she had filled out, her nondescriptness had livened up, the constant want and our inability to get along had imbued her with something predatory that enticed men. Thirty years ago nobody had noticed her, women were always looking at me. Now men’s glances would cling to her attractively sagging breasts, peep beneath her short skirts, and settle on the seam of her black stockings. Her exaggerated intelligence made her appear unattainable and inflamed men, just as a cat-fight arouses them. The woman’s intellect, her unfortunate knowledge of all sorts of useless facts, provoked the male, attracting him like a medieval gown, because it hid her essence. You had to force her, to tear off the extravagance of all her bows and corsets in order to reveal her fantasized nakedness.